This fest has fireworks and fire arts, ice sculptures and light shows, bands and singers and so much more. 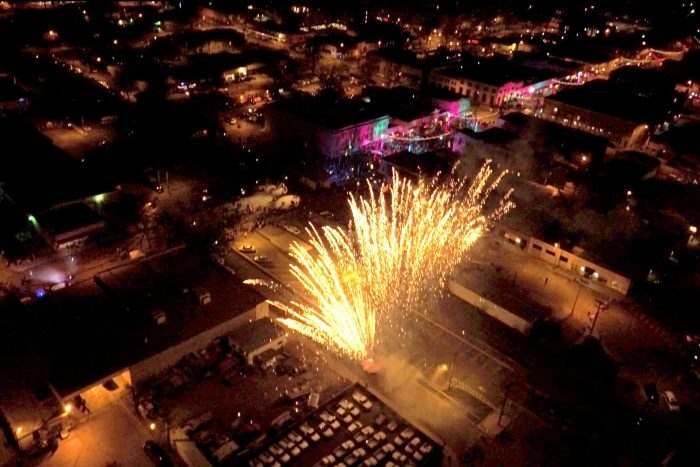 No wonder Loveland Fire & Ice Festival won the Downtown Colorado, Inc. Governor’s Best Festival Award 2016. 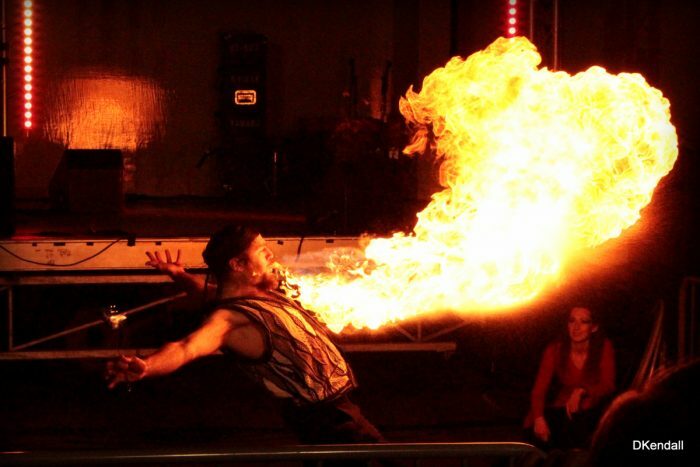 The amount of things to do at the Loveland Fire & Ice Festival will make your head spin. It truly has a little something for everyone. Whether you like live music or are looking for entertainment for the kids — toddler or teens — this festival has got you covered. 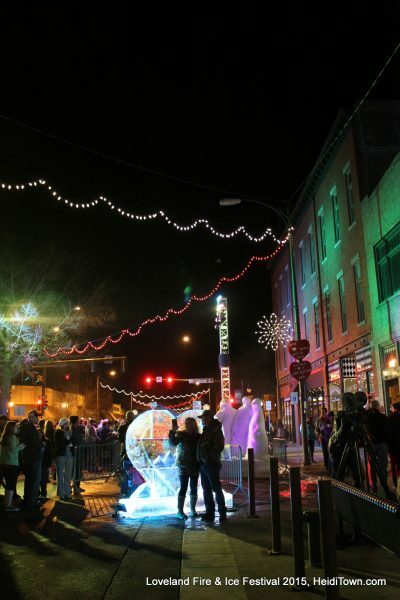 In addition to the festival’s fireworks show that occurs every evening throughout the three day festival, and ice sculptures that dot the downtown landscape, there is a new event happening at this year’s Loveland Fire & Ice Festival. It’s the brand new Brewing & Distilling Arts event. In addition to a carved ice bar that will be on display, local craft beers, ciders, wines, sangria and specialty moonshine will be available to taste via a token system. The Brewing & Distillery Arts events, which happens daily throughout the event, is sure to liven up this already joyous festival. Check here for specific times and token sale information. At its core, Loveland Fire & Ice is a family festival. Children will enjoy a carousel and carnival games. There are also carriage rides available to both families and sweethearts. If you love live music, you won’t want to miss this festival. The musical lineup on the event’s Main Stage is filled with bands that will keep festival attendees dancing in the streets of Loveland to the sounds of classic rock, blues and pop. There will be three more places to listen to music over the weekend including the Cleveland Performance Stage, Lincoln Performance Stage and Jefferson Performance Stage. The festival’s website has a complete lineup of performers on each stage on their Attractions page. Visitors can also shop at Loveland Fire & Ice Festival in the event’s Marketplace featuring multiple vendors and exhibitors. Should all this excitement make you hungry, visit the Food Truck Food Court which will host 13 different vendors selling everything from coffee to waffles. Loveland Fire & Ice Festival is an extravaganza of fun and an affordable way to entertain the entire family. Loveland is located just 52 miles north of Denver, 58 miles south of Cheyenne, Wyoming, and is just minutes from Fort Collins. 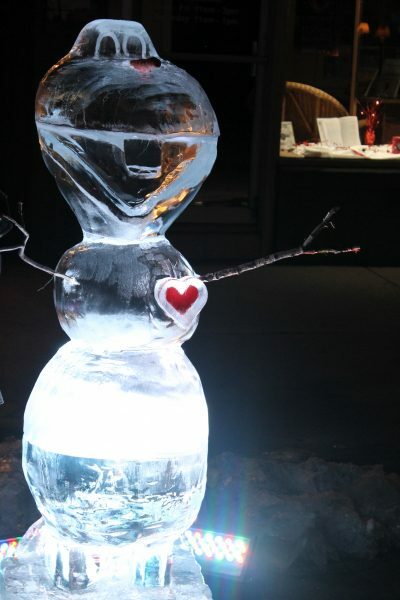 It’s easy to join in the free fun in downtown Loveland this February. But if you have two jobs you won’t have time to travel Colorado! Thanks for stopping by HeidiTown, Dawn. Hope Durango was a blast? What am I saying? Of course it was — it’s Durango!